Introducing a beautiful new range of notebooks adorned with stunning illustrations and photographs from our rich archives. All exquisitely finished and cloth bound with woodfree paper, large pocket at the back and elastic closure. These iconic images were originally commissioned for Batsford book jackets in the 1930s, 40s and 50s. Brian Cook's heightened use of colour encapsulates classic scenes of glorious countryside of old England and his work has become highly collectable. 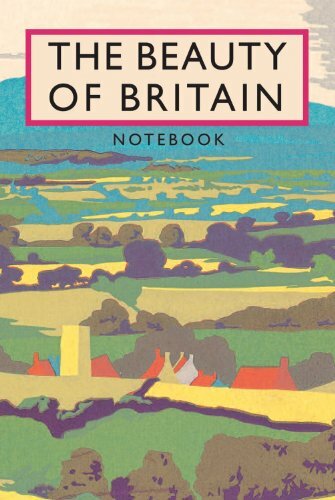 The Beauty of Britain was first published by B.T. Batsford in 1935, with an introduction by J.B. Priestley. The dust jacket illustration by Brian Cook was part of the innovative Pilgrim's Library series published by Batsford throughout the 1930s. Perfect for lovers of vintage book jackets! Brian Cook was the nephew of the late Harry Batsford, chairman of the family publishing firm from 1917 to 1952. He himself became chairman of the company in 1952. His design work, almost exclusively for Batsford, was pioneering and timeless.